My schedule is jam packed for the next several months with very few free spot so I was really surprised to find an opening at the exact time Michler's, a local greenhouse, was offering a terrarium building workshop. 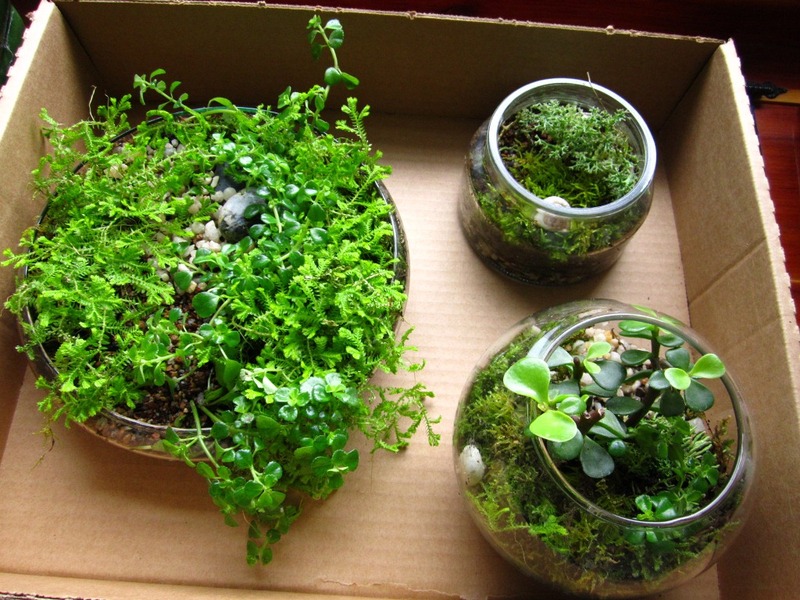 I love terrariums, but I tend to be intimidated by greenery so while I have checked out tons of terrarium building books from the library and spent hours reading about how to build one I have never actually tried it. I love the idea of a class because I can ask questions as they come and I can watch and learn from the process of the other students. Last night was the workshop and I showed up with a backseat full of thrifted glassware that I have been collecting for the day that I finally build a terrarium. Most of the class started with really large vessels for their terrariums and while I had a big glass piece in my car, I decided to do small terrariums since they are really my favorites. I did two open and one closed terrarium so that I could learn a bit about what the differences are and what plants work well in each one. Hopefully I can keep these babies alive and thriving. The is the top view of the closed system. It contains three types of moss- reindeer moss, some wild moss and something else that I can't remember. I found the snail shell laying in a pile of sticks and stuff so I gave him a little place and plan to add some friends.